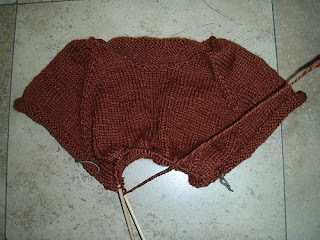 I thought I was going to be frustrated or bored with the forever knitting in the round to do the body of the sweater, but, surprisingly, I am calmed by it! There's lots of knitting that I want to be doing - but for now, at least today and tonight, I'm happy with working on this project. It's also nice that a friend from work is driving me to work until I get the whole car thing figured out, so I have an hour or so of knitting time while she drives! I guess, depending on how we look at things, there's good in everything... sure, my car is wrecked and I have no clear information as to when or how it'll get fixed, but at least I have knitting time! Thanks for stopping by my blog. I'm so glad you weren't hurt, even though your poor car took a beating. Your sweater's going to be lovely. Wow where do you work? What a nice friend to drive you.